It’s a chilly morning in May in the middle of an energy field south of Cody. A group of us watch as rock climber Nick Ciaravella rappel off a sandstone cliff to a nest made of huge branches below. Draper Museum Curator and renowned raptor biologist Charles Preston gesture us over to take a look. Two fluffy white birds look out. 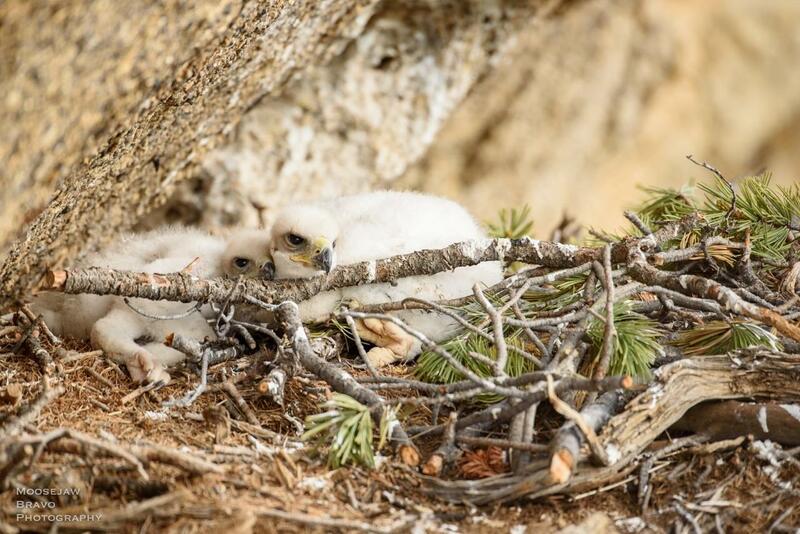 The eaglets don’t make a peep as Ciaravella puts falconer hoods on the nestlings to calm them. “These were on the younger side so they were pretty tame for the most part,” says Ciaravella. “But lots of times they’ll raise their wings at you, open their mouths. Sometimes they even hiss at you a little bit like a cat would. Ciaravella places one nestling in a canvas bag and Preston hoists the bird up on a rope. Preston weighs the bird in the bag then carefully lifts it out. Preston is the author of the 2004 book Golden Eagles: Sovereigns of the Skies. 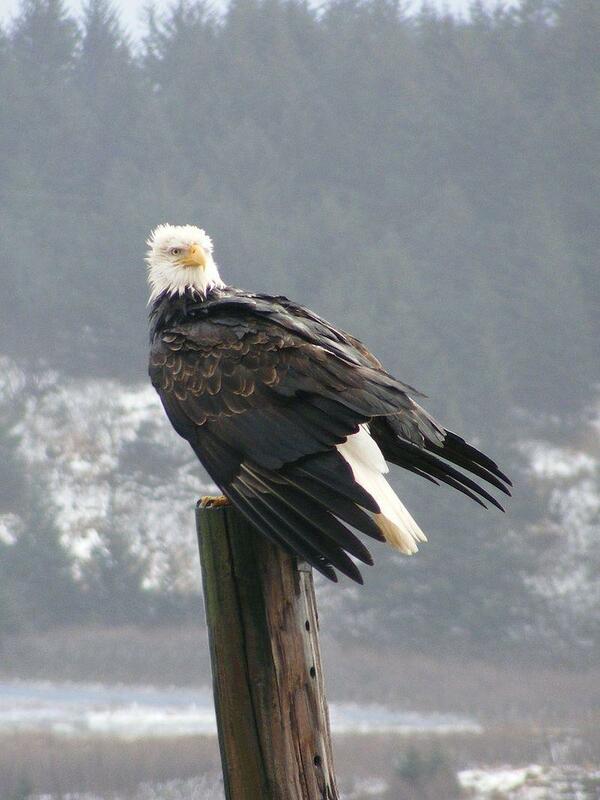 He says these birds hold a special place in our hearts, appearing on the flags of hundreds of nations. “Nobody will eat an eagle?” I ask. Preston says such predators help balance the entire ecosystem community below them. Out here, that means all the way down the food chain to the rabbits and the sage brush. In many areas of the American West, the sage brush where those cottontails thrive is filling in with invasive cheatgrass that grows fast but burns even faster. Some of the nest sites Preston studies even have prehistoric thunderbird rock art near them. He says that could mean eagles have occupied these same nests for hundreds or even thousands of years. 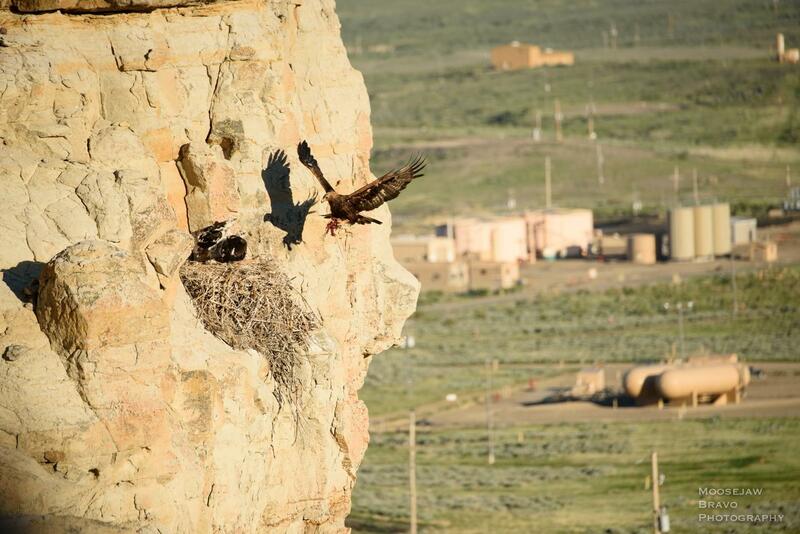 Preston says wildlife agencies should learn from the success of the greater sage grouse and start protecting golden eagles and their sagebrush habitat now, not later. That’s why he’s working with the U.S. Fish and Wildlife Service, the Wyoming Game and Fish Department and the energy industry to come up with a plan of action. 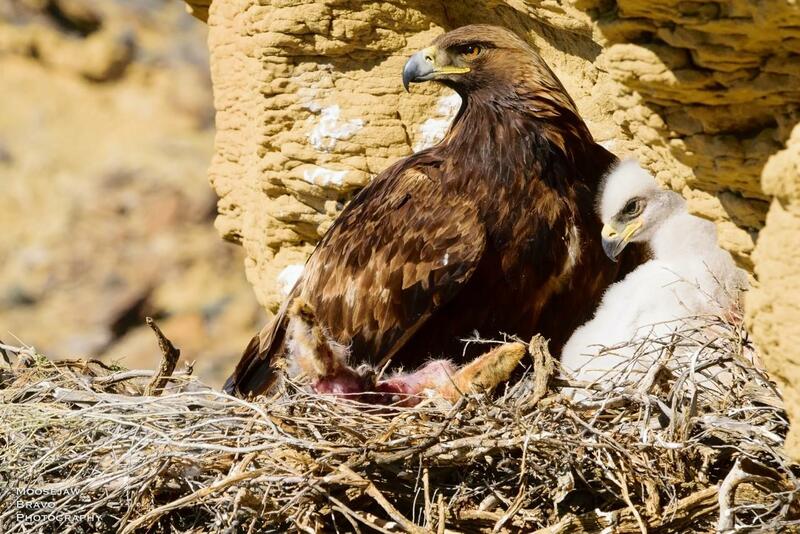 It’s time to return the eaglets to their nest. Preston lowers the second one down to climber Ciavella who’s been installing a remote camera to learn what prey they’re eating in this energy field. “Are there any prey remains?” Preston hollers down. Preston says while this initial phase of the study is wrapping up, he plans to make sure the data collection continues well into the future. “Nick’s taking off the hood now and will place them right back in the nest where they’ll feel comfortable and stay for a while,” says Preston. 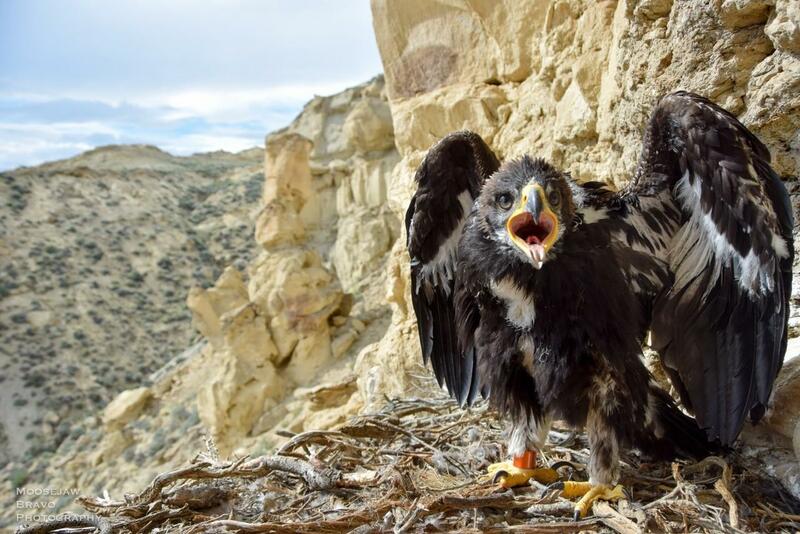 But the question is, will golden eagles stay put in these increasingly disturbed landscapes? Last year, a mysterious collection of stuffed birds was found at the Laramie high school. It was a discovery that was perplexing at the time, but that would end up being a goldmine for scientists at the University of Wyoming. It all started last summer, when a biology teacher was packing up her classroom to move to a new building. In the process, she came across some boxes of stuffed birds. Nobody at the school knew anything about them, and none of the teachers wanted them. So they offered them to the University of Wyoming. In his last days in office, President Obama adopted a ban on lead ammunition for hunting to protect scavengers from lead poisoning. Last week, as one of his first acts in office, Interior Secretary Ryan Zinke lifted that ban. Numerous scientific studies show that eagles, ravens, condors and other scavengers that feed on carcasses killed with lead bullets have a much higher likelihood of lead poisoning. 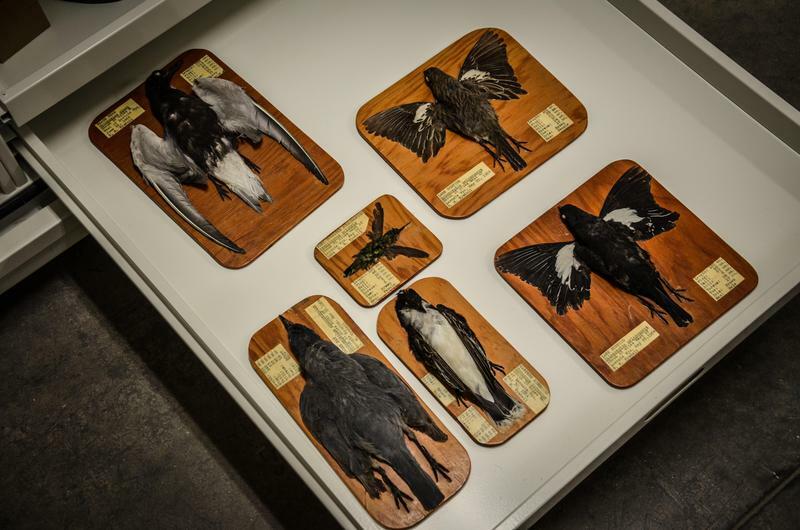 Natural Science curator Charles Preston at the Draper Museum in Cody said that can cause problems with bird reproduction and can even kill them. 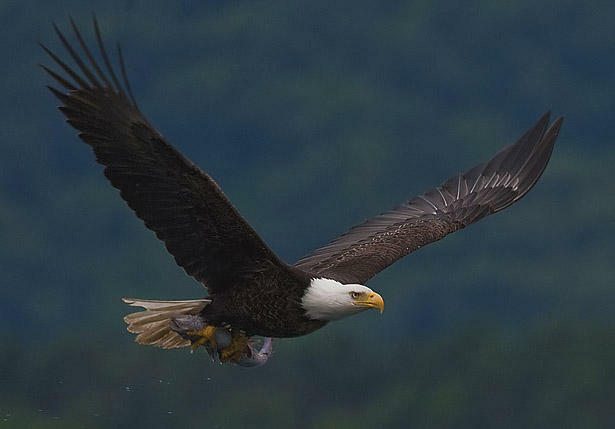 Hunters who use lead bullets may be contributing to the lead poisoning of eagles and ravens. But a voluntary non-lead ammunition program on the National Elk Refuge in Jackson is helping to curb the problem. Back in 2010, the non-profit Craighead Beringia South gave away copper bullets to prove to hunters that the quality was as good or better than lead. Research biologist Ross Crandall says, hunters are natural conservationists and don’t want to contribute to the illness or death of scavengers feeding on their gut piles anyway. For years, no one could figure out why birds of prey were turning up with extremely high levels of lead poisoning. The issue made headlines when the newly reintroduced condor in California began dying off from lead exposure. Craighead Beringia South is a group of wildlife researchers in Kelly, Wyoming who were among the scientists who started studying the problem in other species, back in the early 2000’s. We trek through knee-deep snow along the banks of the Gros Ventre River near Jackson until we come to a heap of bones and grass. 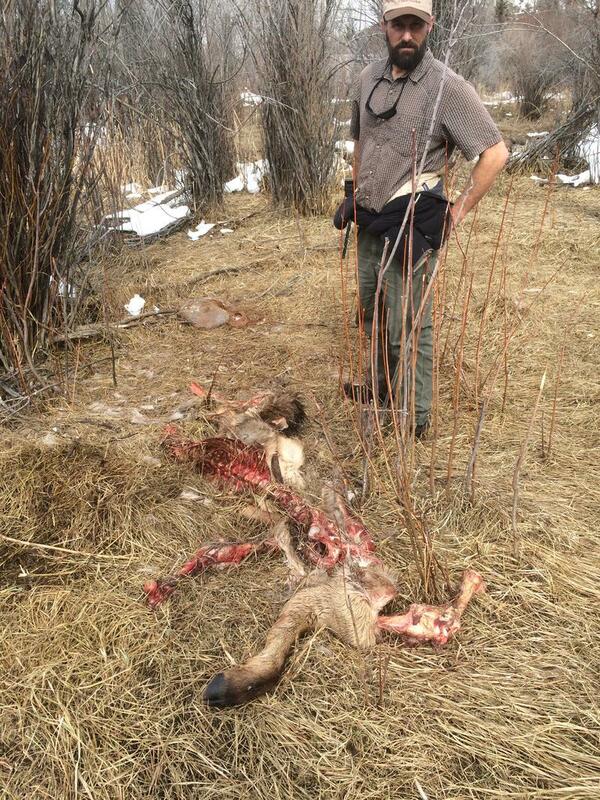 It's what remains of an elk calf. Mark Elbroch is a Wildlife Researcher with Panthera's Puma Project. He tells the story with pride. He’s known this mountain lion, F61, since she was a kitten.